TR24 is a 24 Hour (well 25 actually more on that later) race, made up of as many multiples of a 10K off road circuits as you can manage. The field, 2200+ is largely made up of teams of 2-8 runners with at least a 100 hardy souls going solo each year. I would ideally like to be following. What mileage I have achieved has lacked structure clocking too many ‘junk’ miles. Looking at GPS data my weekly volumes have been between 35 and 40 miles for the last 8-10 weeks. Few if any ‘long’ training runs however some good distance covered in races Jan – Jul with 50 and 40 mile ultra and 3 marathon finishes. In the immediate build-up to TR24 Coniston Trail Marathon, a couple of trips to the Peak District and a 28 mile race recce provided some longer runs however no real ‘back to backs’ were achieved, a staple of my usual training schedule. One of the great elements of this race, logistics could not be simpler, turn up with your tent, pitch it in the field adjoining the Start / Finish straight and you are good to go. You can camp from Friday evening to Monday morning should you wish. I opted to set up the tent Friday PM as I pretty much pass the venue on my route home but not to occupy until Saturday AM. Race starts 12PM Saturday. Should I enter again I will almost certainly avoid the solo campsite its proximity to the start / finish and therefore the relay pen, meant that my support team were subjected to 24 hours of incoming to outgoing relay runner shouts, the solo camp was also positioned so that it was a thoroughfare to the start finish line with pedestrians seemingly engaged in a who can bang the portaloo door hardest competition. There were much better spots on course that were perfectly quiet overnight. Technical briefing at 11AM with start at 12PM, sensible pen system based on road 10k results meant that the runners from larger relay teams there to compete were not impeded by runners adopting a more moderate pace. I started at the back of the pens with the other solo runners, we chatted nervously up to the countdown and set off conservatively with a little bit of mutual back slapping. The course was truly off road, only a tiny fraction perhaps 800m was on packed trail the rest is open fields of grass and forest track. The course crosses the same ridge several times per lap adding an unexpected element of climb (8500ft over my 14 laps). The very well thought out route weaved through the camping areas at least 4 times providing terrific support through each 10k lap. The support and encouragement of resting relay runners and the crowd as a whole will be one of the strongest memories of my race. The course was tougher than I expected the grass areas were mown but not short so the grass dragged on your shoes, the good weather in the days before the event left the ground very hard indeed, crossing the same ridge several times a lap added a decent amount of climb, there were lots of switch backs particularly through the rutted, rooty, rocky forest paths. I have already seen a pretty good shiner on a competitors blog following a one sided fight with a tree and its root. It made for a great course and diminished some of the mental challenge of running the same 10k loop multiple times. Given the rock hard ground I opted for road shoes over my preferred New Balance MT110’s on reflection perhaps the first mistake. My feet moved around a lot in the Kinvara, lack of proprioception had me fighting the cushioned sole and I ended up pretty foot sore in spite of the cushioning as they have no rock plate. Whilst the MT110’s are a firm ride in hindsight I suspect they would have been the better pick. I developed four blisters, none serious, in matching pairs on both feet on the inside of my big toe and instep. This was simply a result of the road shoes not gripping the foot in the way that trail shoes do. Over the distance developed a very sore left knee, which I would attribute to being a little out of sorts with my shoes. I did plan to swap into the New Balance to see what suited best, I didn’t as I found the ground so hard even through the much more cushioned Kinvara however regret now not doing at least a few laps in the MT 110’s as I strongly suspect they would have been a better shoe for me. My over ambitious plan was to stay out on course in groups of 3 laps for as long as I could to minimise time for stops, simply handing off a change of bottle with my crew each lap. Alternating between Hammer Peretuem and Electrolyte drink to ensure I was fed and watered. Suffice to say putting ‘checkpoints’ a self-inflicted 18 miles apart was not going to be a sustainable approach. The first two laps of my planned group of 3 were very enjoyable as I got to know the course and realised how much support you would get as a solo runner (the crowd quickly worked out the low race numbers and lack of red team snap on bracelet / batton identified soloists). Lap 3 of that first group took a little more grit than the first two however the thought of 15 mins ‘in the chair’ and some of yesterday’s pizza kept me going. I headed out for what I planned as my second group of 3 in good spirits. The first lap of which went by fine the second was much tougher and as I tired I decided that a pit stop was the sensible choice, deciding to pit every second lap from here on. Beware the chair! If I felt tired on the course I felt totally knackered sat in the chair it was still early in the race though and my spirits were good so headed back out, with a little trepidation at feeling so tired at just 50KM. Soon found my feet again, the restorative power of last night’s pizza and some salty crisps having done just the job. I continued alternating Hammer / Electrolyte rigidly sticking to a 600ml bottle per lap. Supplementing the Hammer with water at the drink station just after 5KM (Hammer is a very pleasant drink but not refreshing in the way water is). On the Electrolyte laps I was eating Hammer solids to try and keep to matching the 300 calories per hour I read somewhere that the body can metabolise during endurance running . Whist not unpleasant in the mouth they are by no means a fruity ‘chew’ rather closer to flavoured chalk tablets that need rinsing down with plenty of water. All of this and the rigidity with which I was sticking to it led to far too high a consumption of fluids. This became apparent as having happily passed through 60KM during laps 7 and 8 I felt rapidly and increasingly uncomfortable. My stomach was in such discomfort it dominated my thoughts. My throat for some reason was raw and sore I found swallowing anything including water extremely difficult, I abandoned my drinking and eating ‘strategy’ here. In a do or die moment at the end of 90KM I opted for a very small burger, crisps and two handfuls of Haribo, this lead to what I see as the second crucial mistake. I had planned a quick turnaround and back out to bag 100K in what would have been 13 HRS instead with stomach rather distressed dealing with the burger, crisps and Haribo I retired to bed for an hour. Having kept the food down, the last I was to eat, I headed out reasonably refreshed. My crew now though were a little worried I was therefore instructed to check in every lap. I ran the next 4 laps without too much incident calling in for my usual pit stop with 130km done, I drifted off to sleep whilst my wife fetched a can of coke (another do or die stomach moment I felt) and stayed asleep in the chair for around an hour. Awake again at 9:45 I 'rationalised' that I was lapping at around 1:20 a lap and was therefore only really likely to get in a 14th lap. Decision made in my mind I stayed around chatting for another half an hour and then headed out for my final lap a very nice gentle trot around that would see me in a fit of vanity over performance finish close to the 24 hour cut-off to enjoy the support of the finish line, finish time crowd. I really enjoyed that last lap but had again made mistakes, I didn’t need the extra half hour stop and could have lapped much quicker than 1:20 with effort leaving space for 2 more laps and a 160KM finish the rules being you can start a final lap so long as you pass through the start finish before 24 HRS and return inside 25 HRS. I crossed the finish timing mat at a real crowd induced sprint at around 11:37 AM and declared 23:37 14 laps at least 140KM with 8500ft of climb. Why had I not gone out again when still feeling strong? In part mentally I had prepared for a 24 Hour race and just couldn’t get my mind to accept volunteering to stretch this to 25 HRS. Further having spent the 14th lap almost euphoric at passing each section and landmark for the last time, thanking in great earnest the marshalls and supporters who had encouraged me over every lap I just didn’t find the spirit to do an extra lap which would require me to be back in 1:23 to avoid missing the 25 Hour cut-off. I do really regret that missed opportunity, how much sweeter would lap 15 have been knowing I had pushed myself to stay out there! All in though very pleased with at least 140KM (I heard lots of chatter that suggested the laps were in fact long at closer to 6.5 miles / 10.53 KM, perhaps wishful thinking as that would take my total to 91 miles). Judged against my race aims of building confidence to enter and finish a 100 miler and to bring my family a little closer to my main pastime, TR24 was a fantastic success. I think there were a couple of key learnings firstly that mental strength needs training alongside physical strength and secondly to take a more relaxed view to hydration and fuelling I was simply trying to be too clever with my Perpetuem / Electrolyte strategy, had I eaten and drank what I felt like when I felt like it instead of to a schedule I may well have done better. Specific to the event I will pick my camping spot much more carefully in future and make sure I make the most of the opportunity to try different shoes to see what suits best. Still not drinking water, just the thought of it turns my stomach not all is lost though as wine and beer seem to be sliding down just fine. We ran from from Saltburn to Ravenscar(28.2 miles). The course is due to change this year with a loop being added near the start at Guisborough rather than at the end near Filey. 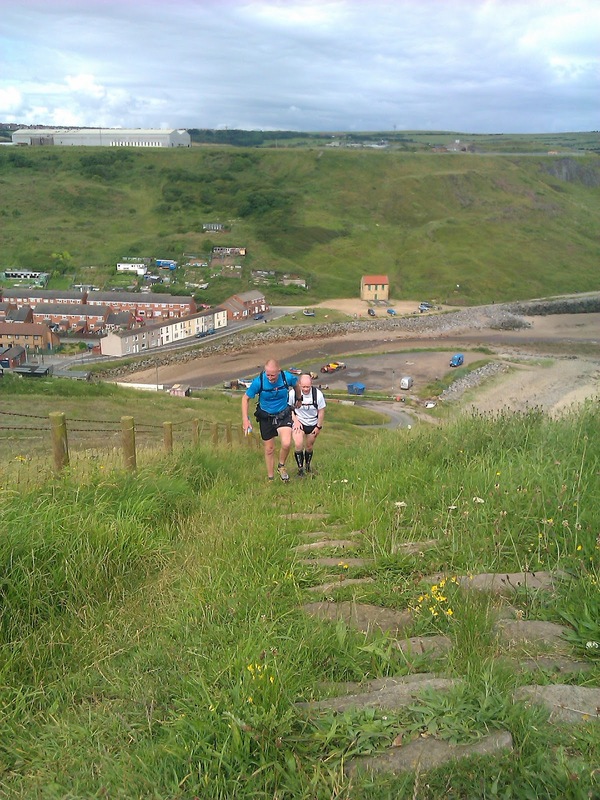 So we picked Saltburn as a known point and decided to run to Ravenscar, that covers some of the more undulating terrain and would provide a challenging run. The logistics involved me picking up Alistair from Ravenscar and then him driving back to Saltburn to start the run. A couple of minor issues with this process due to Phill dropping out, meant last minute changes to the plan, there would now not be a car at the halfway point. I somehow managed to put my drop bag (food, water and warm cloths) into Alistair’s car to take to the start of the run! Hindsight is such a wonderful gift! Have you spotted the obvious floor? The best bit was that I also put my car key into the drop bag, I was literally just about to set off from Saltburn when my brain cell kicked in!The runners Alistair Stewart, Ultra Moorsman, Tim Bateson and Phill (The Tap) Turton was a DNS. I think the picture above is of Alistair and Ultra Moorsman was taken at top of the stairs before the drop down for Ravenscar. From the outset this was a run to learn to the terrain, route and supply points for the first half of the HM60 route. I must pass on my thanks to Ultra Moorsman for sharing his knowledge of the route and terrain, as it meant that we did not have to refer to our route planners once. For me personally the recce was about spending an extended amount of time on my feet after a frustrating couple of months trying to rid myself of niggles and an everlasting cold. I was also really looking forward to the coastal path as I had covered a small section in the Yorkshire Ultra earlier this year and had found that most enjoyable section of the route. I will not talk too much about the views as it might be a spoiler for anyone that is yet to run this route. All I can say is that after running this section as a training run I am even more excited about running it on race day. 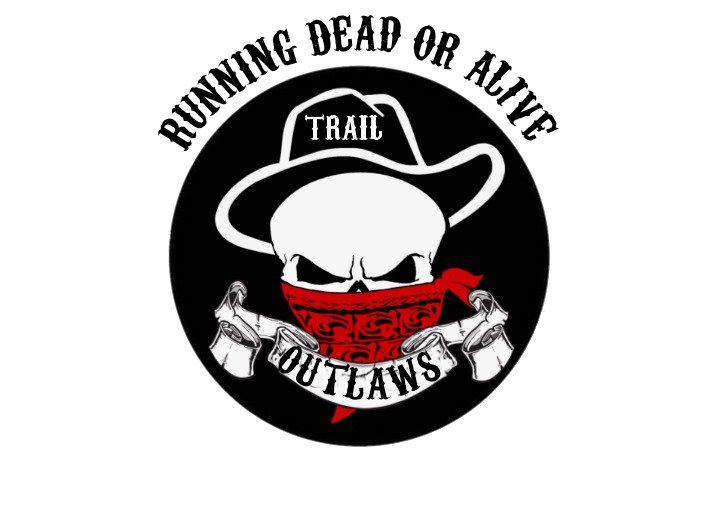 There are a couple of minor navigation points to look at for as you leave towns or where the odd trail splits in two. But by and large you just keep the sea on your left and keep running :) The only other thing that kept popping into my mind is that I also want to attempt the HM 110 next year and it made me realise that there is still a lot of work to do once your reach Saltburn. We managed to eat chips at Whitby and pork pies at Robin Hoods bay. In fact hard to think of a run that provides so many ample opportunities for refreshments en route. There are even proper toilets and access to clean water at most of the small towns that you pass through. I am still fairly new to running and Ultra Running so pleased that I managed to keep myself going on a mixture of flapjacks (posh ones this time Alistair :) ), gels, corpse reviver, coke, chips, malt loaf and water. The key lesson for me with this run was to have variety rather than a bag full of 20 pence flapjacks! Glad to say that nutrition and hydration worked really well for me. Many thanks to Alistair and Ultra Moorsman for keeping me company on the day. 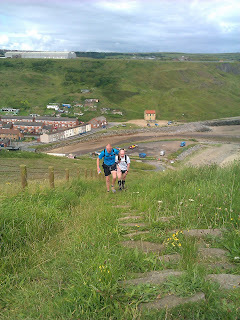 We plan to return on the 08/09/2012 to run from Ravenscar to Filey. So if you fancy coming along then give one of us a shout. A very enjoyable day great views, great weather and great company. Niggles and bugs dispatched. Job Done! It is interesting approaching what is billed as one of the toughest trail marathons in the UK and thinking of it as just a training run but for me Coniston 2012 was just that. My big prize for the year is the Hardmoors 60 trail ultra in September and with that in mind Coniston was in my mind simply 26.2 miles in my legs in race conditions. The race arrived a full 12 weeks before Hardmoors and I prepared for it totally differently from previous marathons. In particular I focused on the less is more principle. Rather than running daily I focused on running 2 to 3 half marathons a week leaving at least one rest day between runs. I have to say that this, combined with doing all my running on trails rather than tarmac has made a huge difference in terms of reducing niggling little injuries and I feel strong every time I go out running. I was also going into this race a full stone less than my last competative outing at the Frostbite 50 so was feeling pretty confident....Importantly and contrary to most principles of marathon preparation my longest run was just 17 miles before this race, a distance I only completed once. This element of my prep did worry me as it had the potential to totally blow up in my face. The weather in Coniston didnt dissapoint us. The rain across the North West had been torrential for weeks and this day was to be no different with us running in awful conditions for nearly the entire race. It made the decision not to camp but to use the YHA seem like a particularly wise one even if the tent would probably have offered more luxury. Having trained solidly on trails for the last few months and having recently taken on a tough trail ultra I was not particularly concerned about the terrain at Coniston, this was to prove a huge huge mistake. Coniston marathon is a VERY VERY tough course with 3500ft of ascents and descents and with large parts of the course involving running on seriously technical trails which were made all the more tough by the amount of water both standing and running that covered the course. In particular I was finding the long descents an absolute nightmare as I battled over wet slippery angled rock beds that had become streams in the deluge of rain the area had suffered. The early part of the race went really well, Alistair and I had made a decision to run a really conservative pace with our focus simply on miles in legs and finishing the race in one piece. Despite the heavy rain the testing ascents soon saw us dumping our waterproof rain jackets into our back packs as our body temps sored and the jackets that not only kept the water out also did a great job of keeping perspiration in. When will somebody produce a truly breathable jacket? I have done a lot of my running recently in ankle braces having sprained an ankle at Frostbite. On race day and for some inexplicable reason I decided that I would wear the brace to protect my previously injured left ankle but would not bother with one on my good ankle. It was to be a fatal mistake and one I am still paying for now. On seven miles I turned unbraced ankle on a rock, it wasnt too bad and luckily I had brought the spare brace with me. A two minute pit stop to lace up the brace and I was back on the move, a little sore but convinced the ankle wasnt too bad. As time went by my confidence grew, the ankle felt strong again and I put it to the back of my mind. The miles passed by quickly and soon we had passed halfway, a mile stone I had been looking forward to as it spelled the end of the major climbs. From here on in it "should" have been a far more easier race. Unfortunately I had not taken into account just how technical and difficult the descents would be. In short they were a nightmare and at times we were slowed to a virtual walk as we clambered through streams and over jagged rocks. On more than one occasion we heard crashes and yelps only to turn and see fellow runners had taken a tumble and on one occasion spill some serious claret all over the rock bed. From 14 to 21 miles the course was a mixture of rocky terrain and what seemed like bottomless muddy bogs and on many occasions we were running nearly knee deep in icy cold stinking mud and water but I have to say that far from spoiling the race it was absolutely fantastic. As we entered the last 5 miles we were moving freely and if anything both Alistair and I were picking up the pace and picking off runners as we went. The trail ran along the river bank of Coniston but it was good at this point although single file. I felt strong and headed a small train of four or five runners through this point. Entering the last 4 miles a familiar foe returned to ruin my 2nd race on the trot. As we passed some walkers on the trail I side stepped and rolled the ankle I had tweaked earlier but this time I had done it properly and once again I found myself in the familiar position of writhing around on the floor, screaming in agony with a sprained ankle. Having been here before at Frostbite (and run on it for 25 miles) I knew the initial pain would only last a few minutes and with just 4 miles to go I decided to go on (not much choice as in the middle of nowhere). It was an awful last 4 miles and as anybody who has sprained and ankle will tell you the fear of putting your foot down and turning the ankle again is absolutely sickening. After what seemed and age I finally approached the school field and the finish line and crossed in 4hrs 48 mins. It is a sign of just how tough this race was that I was absolutely thrilled with this time. Well 2 weeks post race I find myself in a familiar position, recovering from an injury and being unable to run. I have researched why I could be having trouble with my ankles and have invested in a wobble board in an attempt to both rehab my injured ankle but also to strengthen all the muscles around both ankles to prevent future injury. The wobble board is quite good fun and I can feel that the excercises that I am doing are working the ankle although only time will tell if it will prevent injuries in future races. In terms of the race itself I felt really good and really strong despite my reduced mileage during training. The lack of 20+ mile runs simply did not inhibit my ability to complete what was a pretty brutal marathon course. This is something I will use again as I prepare for marathon distances in the future although I think it would be foolish to believe I could do this for ultra distances too and the last place I want to realise I am undertrained is half way round the Hardmoors 60. The biggest lesson was however not to alter the things that have worked through your training. Why oh why did I not start Coniston wearing both braces? It is a decision that I have paid a huge price for and that could potentially put me out of both the upcoming Northumberland Trail Marathon and Hardmoors too. Thanx to Alistair for some great company both on race day but also chillin in the YHA the night before. Arriving the day before a race is definitely something I recommend, it was great to get focussed, to be able to talk running rather than get dragged round the shops while pretend I was not focusing on my race and just get into "the zone". The pack this time was a solitary runner, we were on the North Yorks Moors in January perhaps a little further than half way round the 'Frostbite 50'. I had sometime ago lost my place on the route map. I was relying on the runner next to me to navigate he appeared a little annoyed by this. I had asked if it was OK to run together getting a disgruntled nod and grunt in return. Whilst nodding and grunting the runners eyes conducted a quick survey in search of my route instructions and map,since I had long ago consigned these to my pocket, his search yielded zilch and confirmed his suspicions, I could almost see the internal dialogue as a speech bubble above his head 'aye right, run together you lazy mapless b@stard'. My appraisal by return showed this runner to be the personification of organisation and responsibility map and instructions to the fore, thumbs marking both our map position and the relevant section of the route commentary. It didn't take a degree in body language to decode the withering nod and dismissive grunt as a 'feck off and do your own navigating pal'. Over the next few miles my unwilling navigator did his best to shake me off alternating sections of running at a blistering pace with passages jogged at a near crawl, finally resorting to a need for a 'natural break' to force me on on my way. Shamelessly rather than risk getting lost I mirrored both his pace and need for a 'natural break'. When he stopped for his second 'natural break' in so many miles I decided it was time to man up and press on alone. Some anixious miles followed until I caught up with a group of soldiers who were very happy to lead and to whom the navigation was no challenge at all. It's not that I am lazy I had read and reread the route instructions, had with me the OS map and compass but just couldn't put this together to place myself and track the route. With the shame of my totally unnecessary 'natural break' fresh in my mind I redoubled my resolve to be more self sufficient out on runs. A search of the web yielded very little beyond advice to join local walking clubs adverts for outdoor pursuits weekends and links to orienteering clubs. I was therefore delighted to discover a new website fellrunningguide.co.uk , I exchanged a couple of emails with Dave Taylor, we agreed a very reasonable fee and set up a days one on one fell running and navigation training. I met Dave in a cafe in Hathersage in the Peak District we discussed what I wanted from the day over a coffee and headed out on a run. The weather was filthy but somehow this added to the day giving it a real gritty fell running ambiance. Thankfully Dave let me dictate pace or perhaps lack of it. Dave provided a map and compass and set about the task of demystifying navigation for me. Where I had perhaps expected to and had been anxious about wrestling with terms and techniques like taking a bearing, finding true North etc We instead focused on practical guidance; looking up at the landscape and down at the map and marrying the two together. Setting off moving we put this to use thinking about what we expected to see as we followed the route, how long it should take us to reach certain points and before I knew it Dave had me leading us along the route. I can't overstate how satisfying this felt. I missed a few turns but with Dave's coaching got us back on track. A gem of a tip was to change my Garmin settings from Miles and Feet to Kilometres and Metres to match the grids and altitude markings on the map. Going back out into the driving rain and wind after some lunch in town we headed up the Stanage Struggle fell route, the conditions meant that we had to keep moving perhaps providing a more realistic race feel. Dave again encouraged me to lead and added to the navigation training by having me try and pick routes through open areas. I managed to take us down a few cul de sacs which saw us crossing bogs and a little bracken but it only added to the fun. Throughout the day I had a big silly grin on my face and whilst I know that we really only kept to the basics I am certain I learned more than enough to navigate myself around my next Ultra. I enjoyed a fantastic days running in great company and cannot recommend highly enough Dave Taylor of www.fellrunningguide.co.uk he managed to pitch the day exactly where I needed it. I will certainly invest in some more runs with Dave to build on the foundation provided. 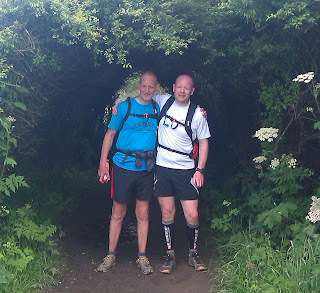 Dave's services include navigation training, guided runs, a race recce's and plenty more. If like me you are fed up with the pressure to 'run with the pack' then give him a call. This course and a stomach upset smashed me to bits last year, I shuffled and puked my way round finishing just inside the 6 hour cut off time. I had of course resolved to train myself to destruction and exact a revenge on the fells of Coniston, how did it work out? Perhaps put a few too many events in the calendar this year seem to be going from race to race with little rhythm to my training . A new job complete with a long commute has not helped. With an eye to the Adidas Thunder Run later in the month decided to train through without taper. Still managed to lack any real volume or intensity to my training. Managed one or two 60 mile weeks in the build up but mostly hovered around the late 30's and early 40's, with a proportion of that done on the Dreadmill. On a more positive note did manage a little hill work and a trip to the Peak District to find my 'fell feet' (more on my fell running trip with Dave Taylor of Fell Running Guide in a later post). With a 2014 MdS slot to pay for my approach to running and racing has out of necessity entered a period of austerity. With this fiscal responsibility toward family finance at the front of my mind toyed with the idea of camping, my running partner for this MR Phil Turton suggested a compromise and booked the YHA in Ambleside, a wise decision indeed given the weather. Arrived Ambleside in plenty of time and enjoyed a very relaxing day with Phil pottering around the YHA and Ambleside itself, took advantage of the self catering kitchen and cooked up a large bowl of noodles each. Hopefully this in some way balanced the large sack of fried tates we scoffed earlier in a ying and yang balancing act between fast fatty food and home cooked goodness. Grown men should not be required to sleep in bunk beds outside of prison and possibly stag nights. Not a great nights sleep but adequate. Quick technical briefing gathered in the hall, then out onto the field for a few minutes before the start. Looking around at the collection of racing snakes young and old it was clear the races reputation for challenge had attracted a pretty competitive field. Started the race jacket, hat and gloves on which I soon regretted. Started toward the front of the pack and was passed by a good number of runners through the first wooded section and plenty more on the initial climbs. Not worried I stuck to my race plan with a quiet confidence that I would see a number of these runners again later. First several miles passed happily, removed the jacket and gloves at the first opportunity all was well until around mile 7 when my running partner for the day MR Phil Turton turned his ankle. A few moments lost to Phil fitting an ankle brace, bit of sterling dib dib dobiness if I ever I saw it now there is man who came prepared. I gulped about a third of the Perpetuem bottle. Quickly we were on our way reaching Tarn Hows, I must have had some sort of previous year flashback here as in the driving rain at a moderate pace I heated right up and was sweating heavily (visible on pictures), found the two laps really hard and was blowing badly up the inclines. Phil confided later he thought I was shot at this stage. I am not sure why I felt so flat but do remember my stomach really not appreciating the long gulp of extra strength Perpetuem, think I will keep this for Ultra's in one hour bottles. Happy to get off Tarn Hows and up the final few miles of the initial climb we made decent time on the wide packed paths and started to interchange places with some runners in front catching them on the flat and downhill dropping back as we walked the tougher inclines. Topping out the climb of the initial 14 mile uphill is a great feeling. The next section is a technical downhill on sharp, craggy, wet rocks which is great fun. Did hear a runner go down hard behind us, a quick look confirmed that it was some spill with claret everywhere, hope he was OK. Enjoyed the technical climbs and descents of this next section a great deal getting out onto to the ridge over looking Coniston is the absolute pinnacle of this race. You know at this point there is just one big climb left and the scenery is incredible. Coming off the ridge and through the boggier sections as you round the lake and head for home is where I had expected to put my pretty well preserved legs to use to gain some time and places. The wet weather though made this section extremely boggy and not well suited to pushing the pace, thus making the decision to run the early hills so conservatively a poor one. Up the final 95M climb and into the last checkpoint in good shape, popped my blood pressure pills, drank some water and off we went. Knew from last year that the section at water level around the lake is super treacherous but with strong legs made really good time and started for the first time in the race to haul back other runners when ... ... an animal cry when up in front Phil had done a proper job of his ankle this time. Hung around for a couple of minutes whilst he swore, he sent me on so left him with some encouraging words and comradely kiss on the head. Having dropped a good number of places set about at least getting back to where we were in the standings and managed to get a good pace going, perhaps enjoyed this section more than any other. Coming off the lakeside into the caravan site picked off the last of the 5 or so runners that had passed me and set my sights on the 5-6 left between me and the finish. Continued at a good pace, although started to find it tougher. With the last 3 people in my sights had a rare gentlemanly moment and thought it a little unfair to pass the two ladies directly in front in the last few hundred metres of the race, so tucked in comfortably and showboated a little across the line. I was delighted to see Phil stomping across the field oblivious to his injury just a few minutes later, oh the restorative power of a comradely kiss on the bonce! Used the school showers and had the best burger of my life from the gourmet burger van. Once again a fantastic race, supremely well organised, with a superb atmosphere in spite of the filthy weather. I am OK with the time, I do not plan to go back next year but will run it again, when I do so I will be targeting a 4 hour finish. The New Balance MT110's were supreme, much comfier than the inov8's worn last year, they handled every surface and left my feet without a hot spot or blister. When you know you are going to get your feet wet Merino socks rock, toasty warm feet free of blisters in spite of the weather, awesome. I much prefer Perpetuem as a single sachet per bottle than mixing the stronger multi sachet multi hour bottle, it definitely upset my stomach when I gulped it down before Tarn Hows and it took me over an hour to feel right again. The early long climbs shone a light on a lack of aerobic fitness that is the result of a lack of training intensity and recent volume. Prescription lots more hill and speed work and minimum weekly log run of 20+ miles. The collection of racing snakes with single digit body fat percentages reminded that I have let my weight creep back up over 13 stone. What the race did serve to remind me is how much I love being in the fells.